A small seating area will be installed on 44th Drive– by Jackson Avenue—this month, with Community Board 2 signing off on the plan last night. Rockrose, the developer behind several luxury developments in the Court Square area, will start building the “street-seat” in front of its Hayden building, which will see a mini box-like structure—decked out with seats, planters and other accessories—go up. 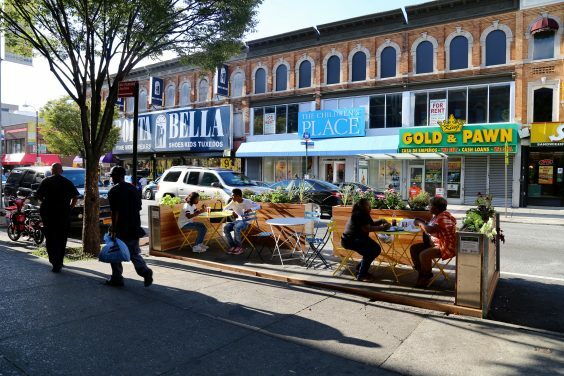 The street seat, which will be 20 feet in length and measuring 6 feet wide, will be up until December and will be the first street seat in Queens. Its installation will result in the loss of two parking spaces while it is there. The street seat, which will officially be located at 25-29 44th Dr., is part of a Department of Transportation program where it works with partner companies that want them installed. Those companies, Rockrose in this case, are in charge of maintaining them and ensuring their safety. Patricia Dunphy, senior vice president of Rockrose, said the street seat would liven up the 44th Drive/Jackson Avenue area, which continues to grow with the influx of businesses like Book Culture and Xi’an Famous Food. The street seat is available to the public, and alcohol and smoking is prohibited. The seating area must be closed each night by Rockrose. The street seat is deemed safe, since it will be installed flush against the curb in a parking lane and will be about 7 feet away from traffic—since there is bicycle lane is in between. There will also be a clear delineator between the street seat and bike lane, and concrete wheel stops will be installed to prevent cars from hitting it. The seats are also sturdy and the city—which oversees 16 throughout the five boroughs—has never had safety problems, according to the DOT. The DOT and Rockrose, however, have had to adjust their plans in order for Community Board 2 to sign off on it. They originally proposed that the seat go up on the Jackson Avenue side of the 44th Drive-Jackson Avenue intersection. The initial plan received push back from the board due to safety concerns. Community Board 2 called for it to be moved around the corner since Jackson Avenue is a truck route, while 44th Drive is not. With the street seat program, community boards must approve them before they can go up. Rockrose and DOT agreed to relocate it, and a public meeting was held at PS 1 MoMA on Feb 16, where the plan was supported by residents and business owners. Community Board 2 voted in favor of the plan last night, although it called for the DOT and Rockrose to come before the board each year for it to be approved upon renewal. Most street seats are reinstalled each year, and operate from spring through fall. Placing people in the middle of the road? The young socialists on the board continue to obstruct people who work for a living like drivers. There are no socialists on the board. Do you know what that word mean or Fox News just told you that was bad? Sure sound and act like Socialists with DUMB IDEAS ! Do something about paving side streets and man avenues instead of always digging them up. Worry about lack of transit and over crowding. Do what they are supposed to do not worry about developers catering to rich Yuppies/Hipsters and out of towners. There are no socialists on the board. Do you know what that word means? Lack of transit? You want the government to provide for you by redistributing taxpayer wealth? Sure sounds like socialism to me…. How about the seating area goes on the sidewalk? that’s too much sidewalk. I’m just here to read all the crazy comments from old people whining about parking. I am sure not everyone is old who does not want this stupid DUMB idea. This is hipster/millennial/developer/Real Estate Cr*p. Some parking should be free it helps businesses too remember. There are no room for business parking lots for in the area. Come to think of it there aren’t many stores around Court Square either. 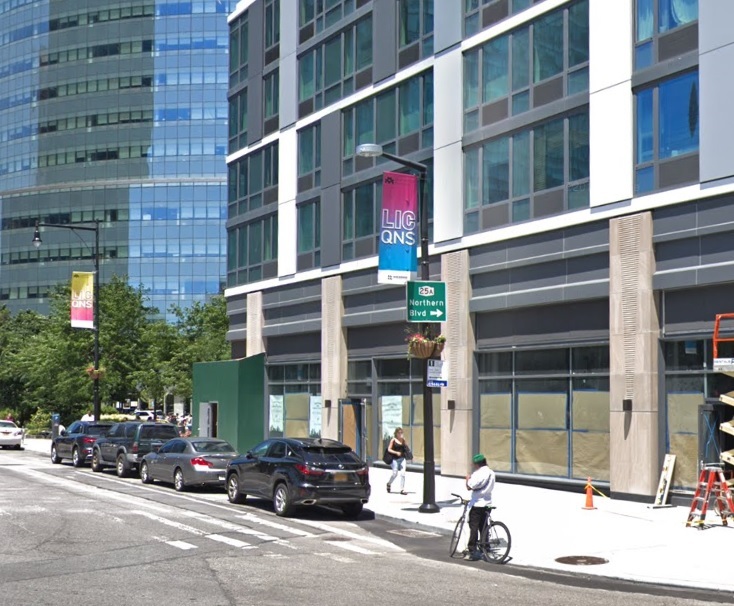 We just lost Domino’s and Subway and maybe the Burger Garage to Luxury Development,just across the street basically from where this stupid idea will be. DUMB, just Dumb. Wait, is it the hipsters to blame, or real estate developers? Not a lot of overlap there. Who else would do something DUMB like this. Developers, hipsters, out of towners. Hope no one gets hurt. We really need less parking. I am sure not everyone is on board with this, especially if you have a car. Which I don’t by the way. Right, you have to pick one though. No mention of the Dumbocrats, DumBlasio, Hillary’s emails, illegal immigrants? MRLIC your losing your edge. You just don’t get it. You don’t know what it is to have a community. I feel BAD for you. LIC is not a community any longer. I am as sane as anyone as I and others here speak common sense, something you and some of the other need to learn. That’s not a rendering, it’s an actual photograph. Those people don’t really look like hipsters…. Another DUMB Idea from Developers and idiots at CB2. I don’t know whom you are calling a child as I and others who comment on this site would not make STUPID DUMB DECISIONS like this. Someone can get hurt or don’t you care. As long as it isn’t you I guess. Bowling for diners – dangerous situation put money on it a car accident waiting to happen. everyone wants to be so cool. CB2 worthless – I want a street tree on my sidewalk on the side of my house I wait 5 years. Doing this guarantees no developer will include green space in their plans. Why would they, when they could just give the community a parking space seat to shut us up? You should pay to park your private vehicle instead of looking for a government handout like a socialist. What are you even talking about? It’s not about the lack of parking. It’s about the lack of green space. drivers to pay for their parking spot via. their taxes.